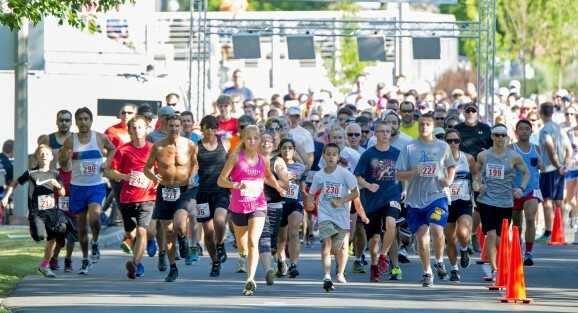 WENATCHEE — Claton Belmont stood in the shade next to the Columbia River, a cup in hand, watching runner after runner — many dressed in red, white and blue — finish the North Cascades Bank River Run 5K & 10K just a few feet away Saturday morning. “It’s been a good day,” Belmont said. Indeed, even at mid-morning. Especially for Belmont. The 60-year-old Wenatchee resident captured the men’s and overall 10K titles, smoking the course in 41 minutes and 56 seconds, and beating runners half his age and more in the process. Bob Sprague, 57, finished second in 42:06, just 10 seconds behind Belmont. Cory Feil, 34, of East Wenatchee was third in 44:13. The women’s 10K also saw a relatively close finish with Wenatchee’s Abbi Milner (45:56) edging Aly Howisey (46:01) by a mere five seconds. 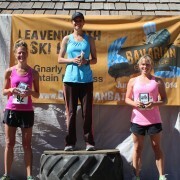 Third was East Wenatchee’s Karen Weber in 47:11. For Milner, a Wenatchee High School grad now attending Western Washington University, the race served as a tune-up for the Chelanman triathlon coming up in two weeks. 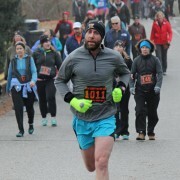 In the race’s 10K Heroes Division — made up of current and retired military members, police officers and firefighters — Kerry McCauley was first among men in 47:44. Jan Alexander was first on the women’s side in 1:31:58. The women’s 5K (and overall 5K title) was captured by Brooke Kingsma, a recent graduate of Jackson High School in Mill Creek. Kingsma, who will be running for Lipscomb University in Nashville this fall, was clocked in 18 minutes and 40 seconds. Runner-up was Soap Lake’s Christine Quantz, who finished in 20:38. Third place went to Shelan Stritze in 22:38. Kingsma said she learned of River Run from friends. 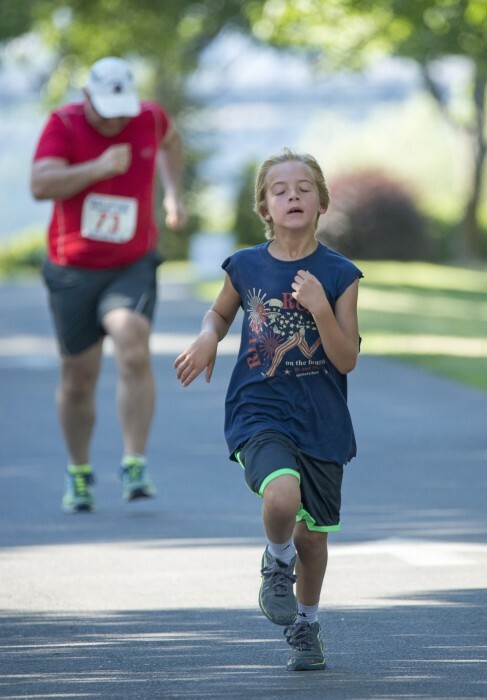 “We have a condo at Chelan and I thought it would be fun to do a 5K around here and then go to the Farmers Market (at Pybus Public Market) afterwards,” she said. Wenatchee’s Phil Hochwalt, who won the men’s title in 18:51, said Kingsma held the pace much of the way. “She was running great. I was just trying to keep up,” Hochwalt said. Skylar Dietrich-Dye of East Wenatchee was second in the men’s 10K in 19:29, followed by Federal Way’s Kerry Farrell, who posted a time of 20:00. 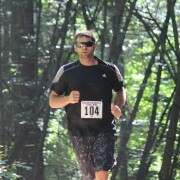 In the race’s 5K Heroes Division. Larry Weidinger of Wenatchee was first among men with a time of 25:34, while Corianne Courtney of East Wenatchee was first among women in 31:02. 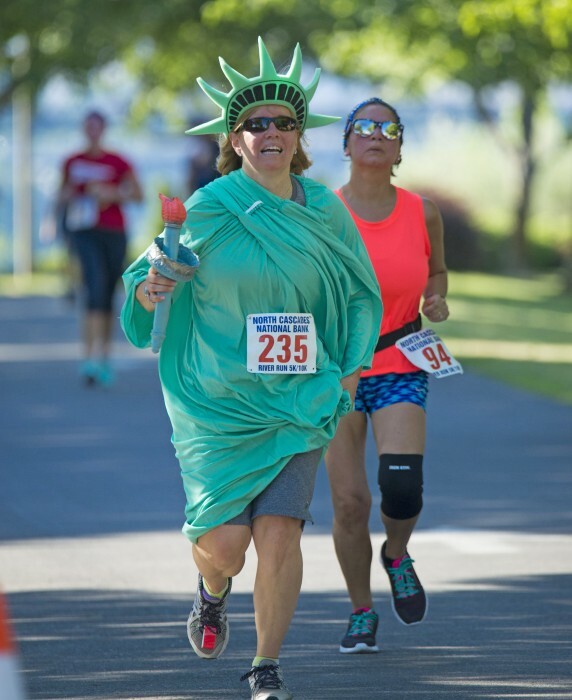 The North Cascades Bank River Run attracted about 300 runners, including several who dressed up to commemorative the Fourth of July holiday. 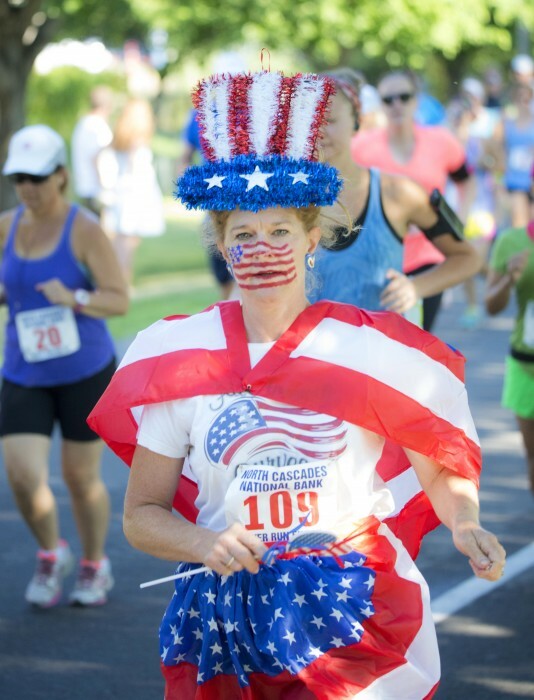 Among them was Janet Hensley, who ran in a Statute of Liberty costume. “I wore it in another race and just thought this would be inspirational,” Hensley said. Alicia Girdler, a soon-to-be senior at Eastmont High School, sported red, white and blue face paint and matching runner’s gear. Girdler is a member of both the cross-country and track teams at Eastmont. “It’s Fourth of July and it’s just a run so I thought it’d be fun to dress up,” Girdler said. With cross-country season just a couple months off, River Run also served another purpose, too. “It’s one of my first training runs,” she said with a smile.